Anyone just learning to quilt has many new skills she needs to learn. She needs to learn to cut precisely so her pieces will fit together easily. She needs to learn to sew straight 1/4" seams, how to press those seams without distorting the pieces and how to measure before adding borders. And that's just to make the quilt top! Then there's basting and quilting and binding. With each quilt the beginner will get a little better at these basic things. We all did, or will. Then we move on to other skills. Maybe we add applique or embroidery or free-motion quilting to our repertoire. Whatever the style, most quilters are always on the lookout for a new technique to try, a new skill to master. In his second letter recorded in the Bible, Peter wrote of several things Christians should be adding to their repertoire as well. These are not skills to master, but rather characteristics to help us better conform to the character of Christ. "His divine power has given us everything we need for life and godliness through our knowledge of him who called us by his own glory and goodness. Through these he has given us his very great and precious promises, so that through them you may participate in the divine nature, having escaped the corruption in the world caused by evil desires. First off, in verses 3 and 4 Peter tells us that we already have everything we need "for life and godliness" so we "may participate in the divine nature and escape the corruption in the world caused by evil desires." So these characteristics aren't beyond our reach. It isn't an impossible task he presents to us. With Jesus as Savior and if we rely on the Holy Spirit, who lives inside us to guide and strengthen us, it is possible to live as God calls us to live. We begin with faith. Through faith we accept Jesus as Savior, which is the first step in living the way God intends. Then, relying on the Spirit daily, we add goodness, knowledge, self-control, perseverance, godliness, brotherly kindness and love. Peter doesn't mean believers suddenly acquire these characteristics or that we don't have to work at them. In fact, Peter tells us to "make every effort." That means we work at being good, we work at increasing our knowledge and self-control and on through the list. Just as a quilter doesn't say she will work on cutting perfectly while ignoring the size of her seam, we don't work on only one characteristic and ignore all the others. We may place more emphasis on one, especially if we are struggling in that area, but we can't completely neglect the other areas. Verse 8 tells us there is no end point, no moment when we can say "I have all the self-control I need." Peter tells us the goal is to have "these qualities in increasing measure." In other words, we should always be trying to become more good, more knowledgeable, more self-controlled, to show more perseverance, godliness, kindness and love. Then we will not be "ineffective and unproductive," which I think means that if we have these qualities in increasing measure then we are experiencing the full result of knowing Jesus as Savior. What about if we don't have these qualities? Peter says believers without them are "near-sighted and blind" and that they have "forgotten that [they have] been cleansed from [their] past sins" (v. 9). That's not how I want to live! It's not easy to focus on improving these qualities in our lives. We'd rather believe we are good enough as we are and spend our energies pointing out the faults of others. But that's not what God desires for us. So, do you have faith in Jesus as your Savior? What about the other qualities? What efforts could you be making to increase your measure of goodness, knowledge, self-control, perseverance, godliness, brotherly kindness and love? Welcome to my stop for the Blog Hop Party with Giveaways! Thanks to the Quilting Gallery for organizing this great hop. I started this snowman table runner a couple of weekends ago, at a Saturday sewing retreat with a couple of friends. Those 75 snowball blocks were made using the stitch and flip method, with corner squares measuring 1 1/8". Can you say 'teeny-tiny'? The snowmen on the ends are all fused, but I've only just begun stitching around them. So far only one of the six can see and none have arms yet. I doubt this one will be finished in time for Christmas, but snowmen can stay out until the snow melts, right? In the process of making all those snowball blocks I ended up with a couple extras. Combine that with a desire to make something to give away during this blog hop party and voila - a mug rug. For a chance to win this mug rug, leave me a comment before the party ends on November 26th. I'll choose a winner on November 27th and I'm willing to ship anywhere in the world, but make sure I have a way to contact you if you win. Followers get a second entry, just leave me a second comment letting me know how you follow. Be sure to check out all the other bloggers taking part! There's a party going on and everyone is invited! 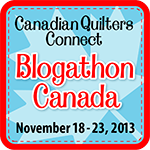 Visit Sew Sisters to see the list of great Canadian bloggers participating and check out the great prizes to be won. I grew up in Nova Scotia, 20 minutes away from iconic Peggy's Cove. Now I live in beautiful Newfoundland with my husband and our 3 boys. In Blow-me-Down Provincial Park in June 2012. I spend as much time quilting as I can and dream up plans for quilting I'll never be able to accomplish in this lifetime! My newest work in progress is a baby quilt for a friend whose little girl was born a little over a week ago. I had planned to make another one similar to the one I made for little Maddie, but plans changed when I saw this cover quilt. That Disappearing 4-Patch block was calling my name! I knew I didn't want to make a big quilt, so a simple 3 x 3 arrangement seemed doable for a baby quilt. And, since this quilt is actually on my Finish-a-Long list for this quarter, it's not really adding something new (or at least that's what I'm telling myself). but it's too dark. There's too much contrast for my liking. Then I thought this pink would work. It's a little darker than the main pink I used, but not dark enough. There's not enough contrast this time. The whole quilt looks a little too sugary sweet, even for a new baby girl's quilt. And found exactly what I wanted. With this aqua there's just enough contrast and the blues stand out a little more, reducing the sugary factor. I can't wait to get this one quilted so I can share the finish! This week brings us to the conclusion of my series on the 'Noble Wife' of Proverbs 31, where we will look at her relationships with people other than her husband. For my other devotions in this series, click here, here and here. To read the full passage, click here. Three verses speak about the woman's relationships with others. In verse 20 we see her doing what she can to address the needs in her community: "She opens her arms to the poor and extends her hands to the needy." Though we don't know exactly how she helped the poor and needy, we know there are many ways to do so. Giving money, food, clothing or any other physical necessity is one way. Helping a person learn skills that could lead to employment is another. Counseling or encouragement is another. All of these options would have been available to a woman in Bible times and they are all still available to us today. In this digital age, the entire world's dire needs are continually in our view. 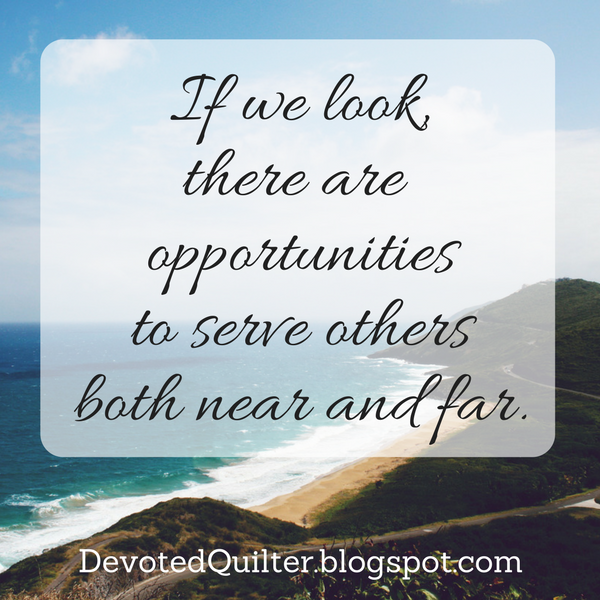 The list of opportunities to give are endless. It is essential to give internationally, as in relief efforts for the victims of Typhoon Haiyan, or child sponsorship programs through organizations such as Compassion or humanitarian efforts such as those by Samaritan's Purse. But I think we should also be trying to meet needs within our own communities. Those are often harder to see because people don't like to appear needy, so they mask their needs as best they can. That the Noble Wife does work to meet the needs of her community says a lot not only about her willingness to help, but also her awareness of the needs. How often are we so wrapped up in the concerns of our own lives that we don't even see the needs of others? We have to keep our eyes and our hearts open to truly see those around us. Verse 26 moves a little closer to home, showing her relationship with those who look to her for wisdom and guidance. "She speaks with wisdom, and faithful instruction is on her tongue." Maybe these were younger women in her social circle, or even those she worked with in some capacity. Though the term doesn't appear here, she would have been considered a mentor to others. She shared her wisdom freely and helped others learn whenever her help was needed. Many of us are free with our advice, but how often do we pray for wisdom before we speak? When it is appropriate, do we willingly share what we know that could help others? Verse 28 moves right into the home, to the woman's relationship with her own children. "Her children arise and call her blessed." We've all known stories of parents who appeared to be model citizens, but who were indifferent, nasty or even abusive to their children. What would our children say if speaking honestly about us? Would it be that we were too busy for them? That we were always impatient? Or do they feel we take time for them, that we love them and value them for who they are right now? Would they tell of constant gossiping? Of judging others or speaking negatively about those we pretend to like? A child's impressions of our actions could be quite revealing. Would they call us blessed? What would we need to change for them to see us that way? Proverbs 31:10-31 offers a picture of a woman who is hard-working, kind and generous to all. In short, she is exactly the sort of person every Christian woman should strive to become. I certainly don't feel I measure up to that standard. Do you? If not, what steps can we take to improve each area of our lives that needs work? Today it's my turn to share my projects for the 'For the Boys' blog hop. As always, Mme. Samm of Sew we Quilt has come up with a fun theme to get us thinking and planning fun projects. Thanks to both her and Amy of Sew Incredibly Crazy for getting us going and keeping us organized. For this hop I made two things, one for my three boys and one for my husband, Paul, who isn't often the recipient when I'm making things. Aiden and Zach needed a bag for carrying their piano books to their lessons and Nathan needed a new bag for carrying toys and books to church, so I made them a messenger bag. Yes, just one bag. They're very good at sharing. 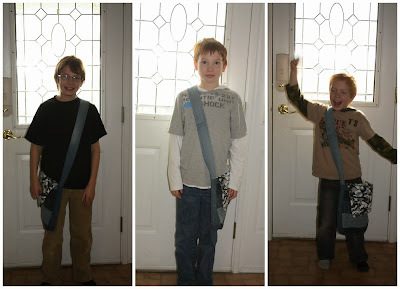 I made the body of the bag and the strap from old jeans, mostly from the three boys. The inside fabric is an old blue sheet and even the batting was all scraps, so only the camouflage fabric for the flap is new. Zach came into the room once while I was sewing and picked up the camouflage. "This is cool fabric," he said. Does this mom know her boys or what? ...and the back of the bag. My three models displayed varying levels of excitement when I asked if I could take their pictures with the new bag. The first time Nathan tried out the bag I just laughed. It's a little long on him! Oh well...he'll grow into it. I made this cross-stitch for Paul about 10 years ago, after he saw the pattern in a magazine I was using for another project. Then it got stuck in my trunk where I keep my fabric stash. And there it stayed. Every now and then I'd see it and think, "I should do something with that." But I'd move on again and these poor dogs would keep waiting for the right moment. This hop gave me the incentive to finally make something useful of it. A little Christmas mini for the wall is much nicer than an unfinished piece stuck in my stash. The whole thing measures 14" x 11 1/2". When I showed this to Paul he laughed and told me he had completely forgotten about the cross stitch! So yes, it was a UFO for way too long! Be sure to check out the rest of the wonderful projects made by today's participants. I'm continuing this week with my exploration of 'The Noble Wife' of Proverbs 31:1-10. Click here to read the full passage, here and here to read the first two devotions of this series. The theme this week is work and 10 of the 22 verses in this passage are about her work. The Bible is clear that we are all to be hard workers. See Colossians 3:23, 1 Thessalonians 4:11 and 2 Thessalonians 3:10. The Proverbs 31 'Noble Wife' is simply a portrait of how that looks lived out day-to-day. So, what can we learn from her example? The second part of verse 13 says she "works with eager hands." I think this means she enjoys the work she does, which is as much a matter of attitude as anything else. We can choose to grumble about the work we need to do or we can find ways to make unpleasant jobs more enjoyable and we can remember to thank God both for our work and for our ability to do it. Verse 15 says, "She gets up while it is still night; she provides food for her family and portions for her female servants." Now, I really don't like getting up while it's still dark, but I find my entire day goes better is I get up early enough to shower and get dressed before I have to worry about getting the boys up and ready for school. This time of year, that means getting up before the sun rises. I don't know what they ate for breakfast back then, but I can relate to this woman who made sure everyone had food to start the day off right. I find it interesting that though she had servants, she provided the breakfast herself rather than leaving it for the servants to do. I wonder if she enjoyed the cooking and passed less favourite tasks to the servants. Verse 17 says, "She sets about her work vigorously; her arms are strong for her tasks." She's a hard worker, not just putting in her hours or slacking off. This is an important point, since many people put much more effort into their hobbies (like quilting!) than they do their work. Verse 18 says, "She sees that her trading is profitable, and her lamp does not go out at night." I like The Message rendition better. "She senses the worth of her work, is in no hurry to call it quits for the day." Not many of us trade goods and bring the profit home at the end of the day. Even if you work retail, a busy day at the store doesn't mean you bring home more money (unless you own the store, of course!). Really knowing and understanding the value of your work is important. It's easier to tackle any job if we feel it has meaning in the bigger picture. I see the first part of verse 13 as being linked with verses 19, 22 and 24. "She selects wool and flax...In her hand she holds the distaff and grasps the spindle with her fingers...She makes coverings for her bed; she is clothed in fine linen and purple...She makes linen garments and sells them, and supplies the merchants with sashes." She started out by selecting good quality raw materials, the wool and flax, then she spun them into useable thread and then used that to make clothing for herself, blankets for their beds and items to sell. She followed through with each of the tasks, working until she had a finished product. While we don't have to spin our threads or even make all our own clothes, we can certainly learn a lesson from a woman who finishes what she starts. How many of us start projects that we never finish? Whether they are quilt projects, home improvement projects or employment related projects, we should be careful to finish what we start. Verse 27 says "She watches over the affairs of her household and does not eat the bread of idleness." I think this is in contrast to those women who have nothing better to do than sit around gossiping about others or grumbling about all that is wrong with the world while ignoring the work that needs to be done. It's laziness, pure and simple, and the Proverbs 31 woman doesn't take part in it. And finally, verse 31 says, "Honor her for all that her hands have done, and let her works bring her praise at the city gate." I think this verse is a reminder that we need to recognize others when they have done a good job at something. We are quick to praise our children when they do well, let's also remember to praise friends and co-workers for a job well done. What is your attitude about work? What would others say about your work ethic? 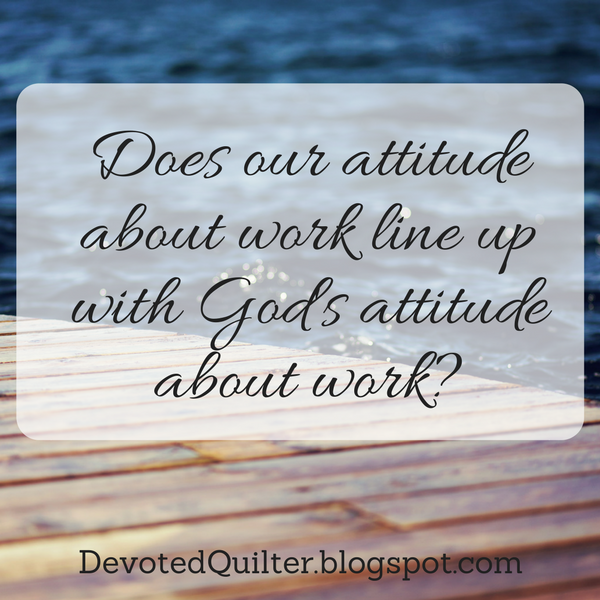 Do we line up with what is presented in God's word as the standard for our attitude and our work ethic? This little sweetie is Maddie. She's 8 weeks old and isn't she just adorable? Her mom, Krista, and I were best friends all through school and she was my maid of honour when we got married. We kind of lost touch over the years, but when I heard she had a little one on the way I knew I wanted to make something for the baby. Quilters can't seem to hear about babies without thinking 'baby quilt' can we? The pattern for this blanket is by Tailor Made by Design. It is so quick and simple to make, but it's really cute too. I love the ribbons sticking out on the sides. In theory, little Maddie will play with them as she gets older and is more interested in the different textures and whatnot. I backed it with a soft blue and quilted on either side of each seam. There is no batting in the middle, so it's not technically a 'quilt', just a blankie. Hopefully it will be well used and loved. Have you ever noticed how much of Proverbs 31 is about the woman's relationship with her husband? If I could ask him, would your husband say you bring him good , not harm, all the days of your life? Would mine, if you could ask him? Not only on the days when we want something, or only on the days he remembers to compliment how we look, or only the days we are happy with the number on the scale, or even only on the days our hormonal balance is just right - all the days of our lives. That's a high goal, isn't it? That doesn't mean we don't speak up when we disagree with him. Nor does it mean we keep quiet when our feelings are hurt. It does mean we remember to fight fair and to treat him with respect. It means we don't try to hurt him and we take the initiative and apologize when necessary. It means we keep our husband's best interests in mind at all times. Before anyone gets upset, thinking wives are supposed to be doing all the work in maintaining this relationship, I should point out a verse in Ephesians directed at husbands. "Husbands, love your wives, just as Christ loved the church and gave himself up for her," (Ephesians 5:15). Loving as Christ loved the church is an unconditional, sacrificial love, guaranteed to be keeping the wife's best interests in mind at all times. 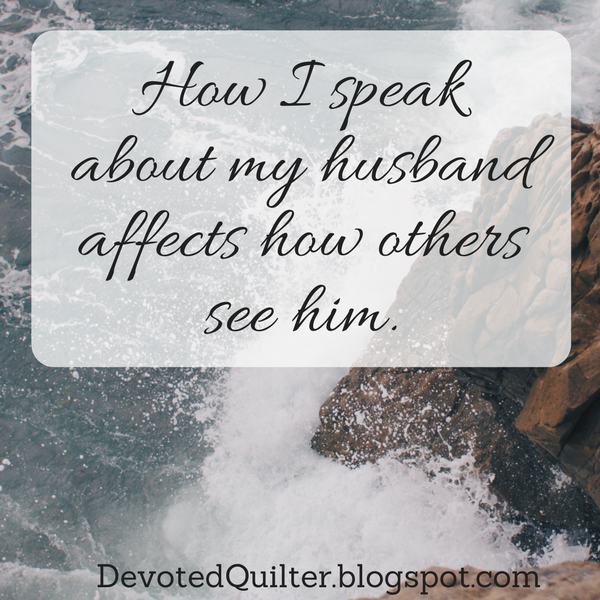 Do you realize that how you talk about your husband to others affects how they view him? Are you aware of the picture you paint of him to others? I have been around women who never have a positive word to say about their husbands, or who share stories that make him sound like a complete idiot. It's hard not to lose respect for the husband, even knowing that I am only hearing the wife's side of the story. Our words have the power to increase or decrease the respect others have for our husbands. We shouldn't pretend our men are perfect or plaster on a smile and pretend a marriage is perfect if, in fact, it is struggling. I mean we must be aware of the casual remarks we sometimes make that could make others view him differently. Sometimes it can be tough to keep quiet, or we justify what we say since we're 'only joking around,' but we should always be aware of the effect of our words. I confess that just the other day I made a comment, 'just joking around,' that I should probably have kept to myself. Nothing serious, but it was a laugh with another woman at Paul's expense and it was unnecessary. In our society the man is often portrayed as a buffoon while the woman is strong and smart. She is competent where he is incompetent. There's nothing wrong with a woman being strong, smart and competent. In fact, I think Proverbs 31 shows 'the noble wife' as just that. I think that's why "Her children arise and call her blessed; her husband also, and he praises her" (v. 28). But let's be careful not to portray our husbands as less than they are in order to make ourselves look stronger, smarter or more competent.